What better way to celebrate Christmas than to give everyone a holiday, not least myself. So, folks, we’re all off to Japan and, as is customary, the pencil-shaped Phileas Fogg of Waterlooville leaves his usual position (causing trouble behind the dugouts on the West Leigh Park Popular Bank) to be our guide. Merry Christmas all. Skif. Arriving in Japan completely jetlagged and astonished at the amount of bowing being aimed in my direction, my first task was to obtain myself a ticket to FC Tokyo v Jubilo Iwata. Knowing no Japanese and armed with my trusty Lonely Planet guide, and more printouts from the hotel staff than you can shake a chopstick at I headed to find a 7Eleven convenience store. I had read online that you could buy tickets from an Internet vending machine in store so I headed to the branch closest to the hotel. There was a huge queue inside, certainly not the kind of queue who I would want to hamper with my bumbling efforts to find a match ticket. I looked behind the counter, couldn’t see anything promising, saw something that looked promising which I later concluded to be a photocopier, and gave up. As I sleepily strolled towards the Meji-Jingu shrine, I stumble across another 7Eleven, but far less busy. With a quirky grin I approached the pretty girl at counter and gave it my best “Kuremasen ka?” (“Could you please?”) and received a puzzled but smiling return. I showed my print outs of directions to the stadium, pointed at the photocopier-like machine that was in fact the ticket dispenser and my intentions were finally realised. 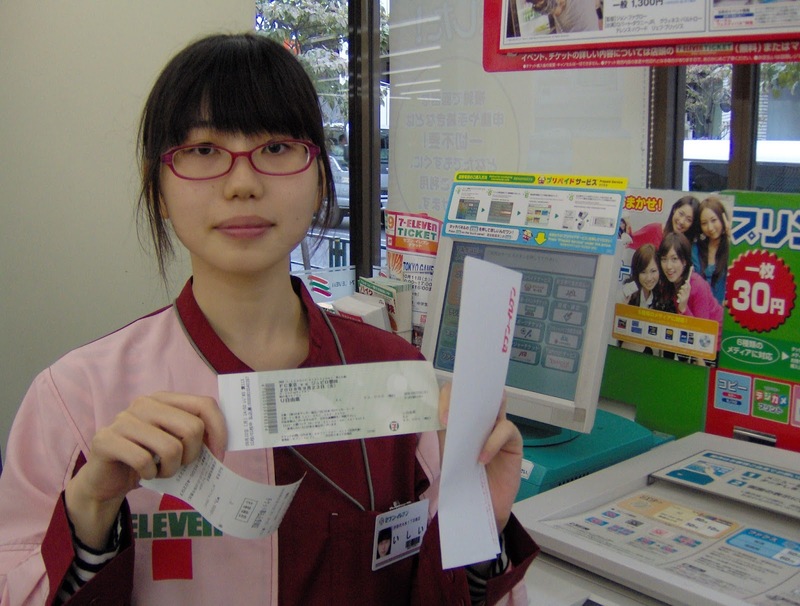 After further help from an equally cute shop assistant, lots of bad Japanese on my part and broken English on their part, I had myself a match ticket. Completely in Japanese script. As I proudly strolled on my merry way, beaming with pride for clearing the first hurdle of my J-League experience, I heard footsteps rushing up behind me. The girl from 7Eleven had run out of the store to catch me up, and hand me… an umbrella. To this day I have no idea why. It did look like it was about to rain, so perhaps I had such an impact on her that she’d given me her own umbrella? Or was it an umbrella she’s taken from the shelves of the shop? Did she think it was my own umbrella I’d left behind? Was it a match day promotion of a free umbrella? On arriving at the shrine I noticed many others with the same umbrella and later noticed outside other 7Elevens there were racks of umbrellas outside. The answer I feel most likely to be correct is that in Tokyo you have an umbrella pool, run on honesty, where you take an umbrella for the day on the trust that you return it. Writes the tourist who left his umbrella in the hotel room. Getting to the Ajinomoto Stadium also posed further obstacles. It was my first experience of the Tokyo subway system and, not only that, the station I needed was off the map. The helpful station staff saw me gaze in bewilderment at the map and came over to help. Moments later I had my Pasmo card and was heading for the correct platform on the correct line. A train arrived and I was on my way, or at least that was what I thought until I realised it didn’t stop where I wanted. Using my new skills of pointing I gestured a girl for help. “Sure! Where are you headed?” she replied, in a thick Californian accent. She later explained that although I was on the correct line, I’d taken the wrong train. I had fallen victim to Tokyo’s varied rail services: local, semi-express, express and super-express. Super. The Ajinomoto Stadium itself was quite spectacular, a circular stadium with a 50,000 capacity. Although it wasn’t used during the 2002 World Cup, it was used as Saudi Arabia’s training camp. 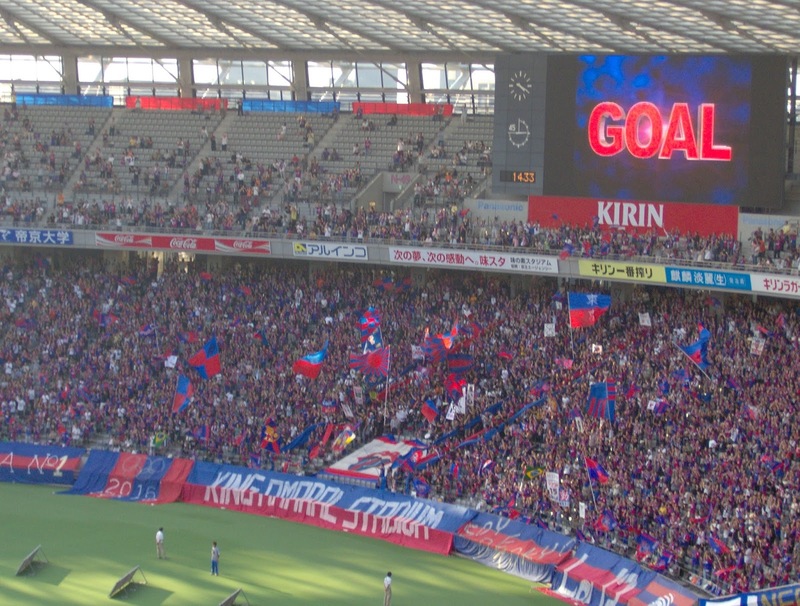 This season was the tenth anniversary of FC Tokyo, and there were lots of banners and merchandise celebrating “moving football”. Fans of static football were to be disappointed. Having no great footballing history in Japan, it seemed quite apparent that rather than for Tokyo to create their own, it was far easier to hijack the best of everyone else’s. The shirts were a clear hijack of Barcelona, the fans flags and banners seemed a hijack of Italian supporters, but the best of all was the club anthem: “You’ll Never Walk Alone”. Before the game the lyrics (in English) were displayed on the big screen, and was belted out by all the supporters. It appeared the man behind me knew every word, and sung as proudly as any Liverpool supporter at the Kop end. As the team sheet was read out (disappointingly also in English) I was struck by the familiarity of one name: Yoshi Kawaguchi. Having been signed for Portsmouth in 2001, if memory serves me correctly his first two touches in a Pompey shirt were picking the ball out of his net. He only played twelve games in two years, and as a result lost his place in the national team, missing his home World Cup. The players lined up for the national anthem, and on walking past each other exchanged hearty bows rather than shaking hands. I then discovered why the rest of the world doesn’t take the J League so seriously. I have to say I admired the energy and enthusiasm of the players, but when that isn’t partnered with any great level of skill, it doesn’t lead to total football. Or should I say, “moving football”. The game was played out and dominated by Tokyo. 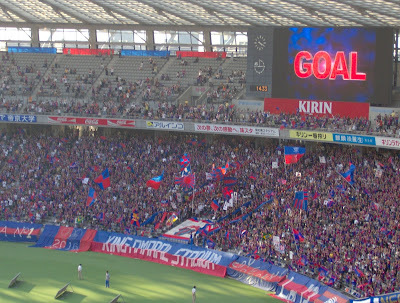 Yoshi was on top form, being at fault in some way for most of the five Tokyo goals. One was as good as straight through him, another a result of him slipping over whilst the ball was headed back by one of his defenders. The game was fun and exciting to watch, and Tokyo more than deserved their 5-1 victory. The post game activities then proceeded, and I was cheerfully surprised by what unfolded. The players lined up once again, just as they did at the start, and bowed for the main stand. 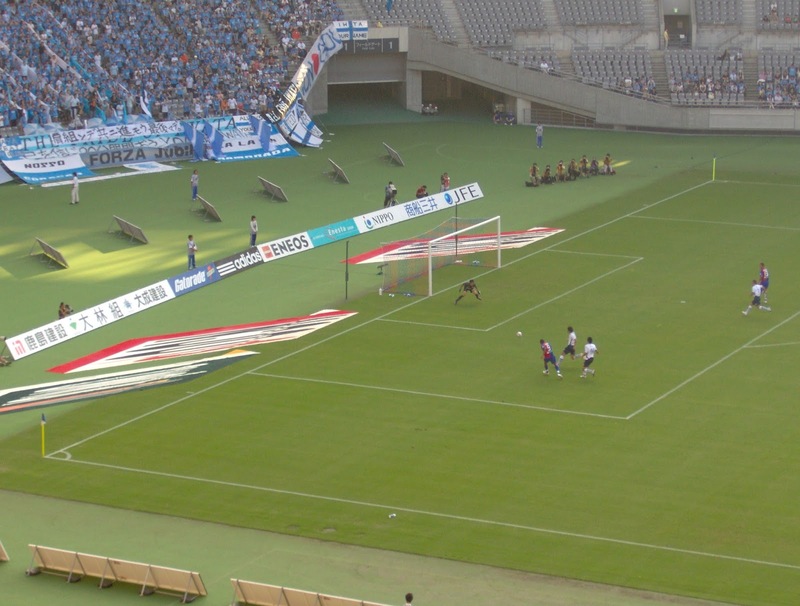 The Jubilo players then headed over to their supporters and bowed at them. I didn’t quite see how a 5-1 loss was worthy of a bow, but the away fans seemed grateful enough. The Tokyo players then went and bowed to the three sections of the stadium with home support. It was essentially a lap of honour, but for a regular league home game. Once all the bowing had finished, the man of the match was stood on a podium, his face plastered on a big screen, a microphone under his gullet and given a five-minute interview. He then bowed and returned to the dressing room. The big screen then displayed highlights of the game, which most people stayed to watch. The bulk of the supporters didn’t actually leave the game until at least twenty minutes after the game. It has to be said that although the standard of football was poor, the entertainment value and quirky Japanese way of running the beautiful game made for an enjoyable afternoon. As I left the stadium I was sad to not be around for the next home game, for it would be “Teddy Bear Day” at the Ajinomoto Stadium. I missed the Teddy Bear game too (but I did snaffle a poster for it). Last year they had a British Day where you could get in for 500 yen with a UK passport. 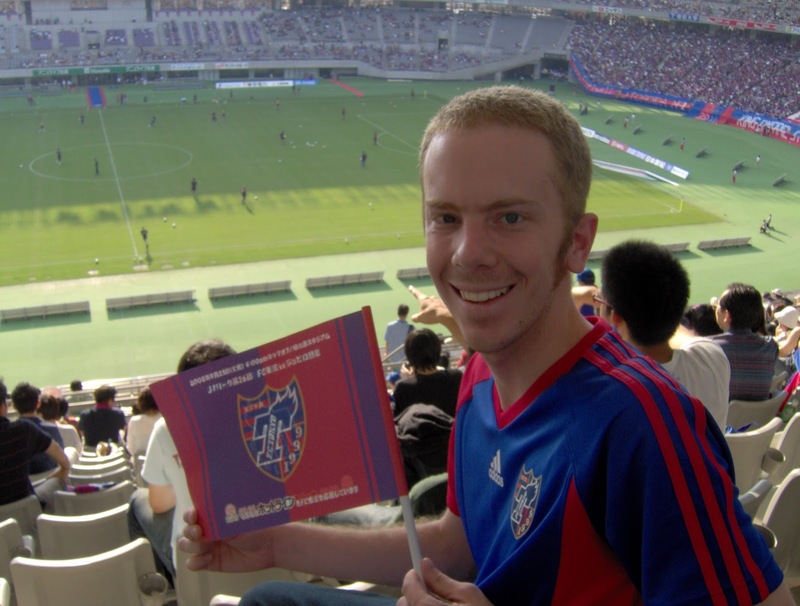 Shame I can't stand FC Tokyo really.